I’m calling you from Nido de Condores, the Condor’s Nest. This was our chance to move up to elevation 18,300ft/5,580m, which is actually almost exactly the same elevation as the summit of Mt. Elbrus in Russia. We’ve carried supplies up with us today to leave a cache since this is where we will sleep tomorrow night. 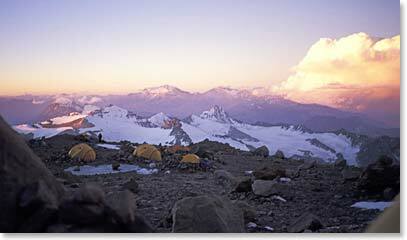 It was about -10C (14F) last night at Camp 1. That’s not extremely cold, but even so, we took our time getting out of our tents this morning, waiting for the sun to come out and warm us up. The Bolivian guys brought us a nice wake-up tea and coffee about 8am, and with that, we lay around in our tents until about 9:30 when the sun was burning bright. Simon made us a great breakfast of bacon and eggs and quesadillas this morning. We also made sure to drink lots of water so we would be nicely hydrated when we left for Nido at noon. It didn’t take us long to climb up here to Nido de Condores and we arrived just before 3pm. Isabelle looked at me with a big smile when she arrived and said, “I’m so proud of myself. That was really difficult and I feel great!” Everyone else had the same good things to report. It was a difficult and windy climb (you can tell we’re in the mountains now) but the team is doing very well. We continue to advance by stages and it feels like we’re going to have a great week here on the mountain. We’ll continue to report how it goes each day.